• The Font Encoder DLL is installed on the system. It is responsible for formatting/encoding the data. • The VBA file is responsible for sending the data to the font encoder and retrieving the encoded data. • The Barcode font is applied to the encoded data. What is an encoder? An encoder is a plug-in, add-in, source code, or dll that takes in raw data and produces output data that the barcode font can understand. 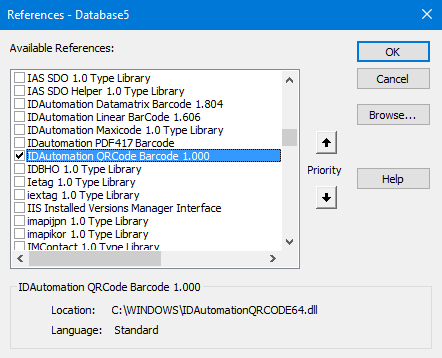 The tutorial explains how to generate Data Matrix barcodes in MS Access. The database is already created and includes a report. The tutorial illustrates how to generate 2D barcodes in MS Access 2013. The database is already created and includes a report generated by data within a table. The tutorial generates a QR Code barcode by encoding the data with the VBA Font Encoder and applying the Barcode Font. The tutorial assumes that the Font and Encoder is installed. 1. 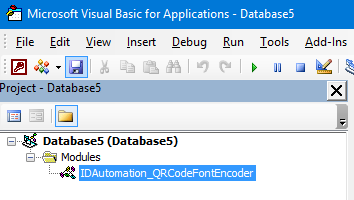 Locate the VBA Font Encoder for the Barcode Font and Encoder Package. For the location of the VBA, view the barcode type that you are attempting to generate above. Remember the location of the file. 3. 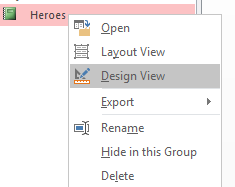 Select the Create tab. 5. In the Visual Basic Editor, select File--Import File and navigate to VBA Font Encoder. 6. Select the file and choose Open. 7. The VBA Font Encoder is placed in the Modules folder. Ensure that only one instance of the VBA file is imported. 8. Select Tools - References then select the barcode type to create and choose OK.
9. Select File and then Close and Return to Microsoft Access. 10. Right-click the report and select Design View. 11. In the Design tab, left-click the Text Box. 12. Navigate to the Details section of the report and left-click. It will place the Text Box into the report. 13. Left-click the label and select the Delete key. 14. Right-click the Text box and select Properties. 15. Within the Property Sheet, select the All tab. 17. To confirm the data is encoded. Double-click the report. 18. Return to Design View and select the barcode field.